Without further ado, let us import a real C3D file and drive a complete model. The AnyBody Modeling System offers you virtually unlimited ways of doing things, and probably more than the average user can comprehend, so we are going to start with a simple and top-down procedure. The AnyBody Model Repository (> 2.0), contains some pre-cooked examples which are easy to drive with your own data and which contain some really neat features for data processing. Make sure you have installed your own copy of the AnyBody Model repository (AMMR). See the AMMR documentation. Go to the folder Application/MocapExamples/Plug-in-gait_Simple. 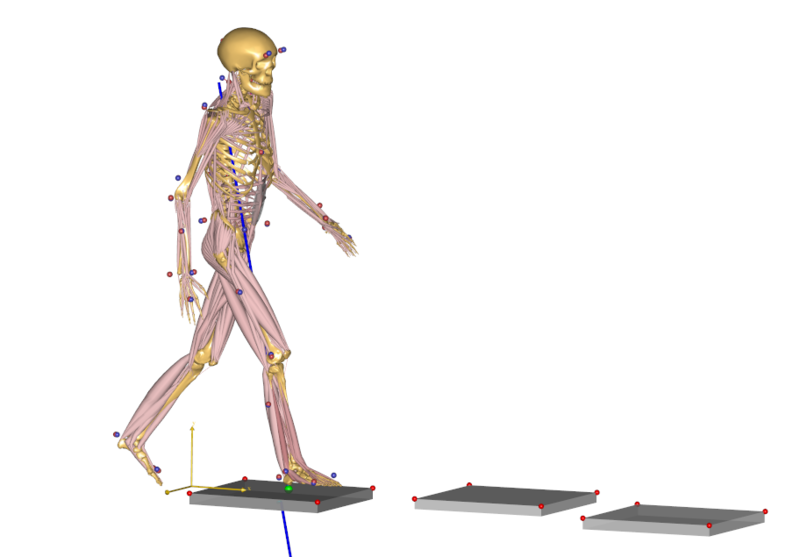 This is a gait model comprising only the lower extremities and the necessary part of the upper body for attachment of muscles. The model is based on a C3D file with “Plug in Gait” marker protocol, and three force platforms. You can easily modify this to any other movement, simply by importing a different C3D file to drive the model with. The model defines three section/files which must be customized. Following this structure is not strictly necessary, but good practice. Finally, on line 13 we include the AnyMocap framework or base model. The model consist of number of operations which must be executed in the correct order. The flow of the model is illustrated in the following figure. If you look closely at the model view, you can see that the skeleton is equipped with markers and if you zoom in a little, you can also see that the markers carry small coordinate systems with red and green arrows. These are the marker points defined on the human body, and the red and green arrows designate directions in which the marker position is fixed versus free to be optimized. A free marker position is one that is not well-known by the clinician. So why would we be in doubt about the position of a marker that we have placed? Well, clinicians place markers on the skin at an unknown distance from the bone, and even when a marker is placed on a bony landmark just below the skin, we are never quite sure which point that corresponds to in the bone’s local coordinate system. If we get those points wrong, the resulting motion of the model will also be inaccurate. So the green arrows designate directions in which we have the greatest uncertainty about whether the marker is placed in the model as it was in the experiment. The good news is that we can optimize those marker placements exactly as we did in lesson 4. The model is set up to do this automatically, and if you are happy with the choice that has been made, you need not do anymore. If you use a different marker protocol, or customize what is optimized you will need to modify the marker protocol. In this example, the marker protocol is define in the file The Setup/MarkerProtocol.any. In the interest of simplicity, we shall postpone the discussion of the marker protocol setup. In addition to the marker coordinates, the model considers the segment lengths to be variable, so the computation we are about to do will also automatically figure out how long the segments are, and thereby where the joints are placed. Pretty much any parameter in a model can be made variable in the optimization study. But some parameters will be determined well by the marker trajectory data and not all parameters can be determined at the same time because the mocap data only contains limited information. For instance, if the model has no movement about a specific joint, then it is not possible to get information about the location of that joint or about the lengths of adjacent segments from the marker data. 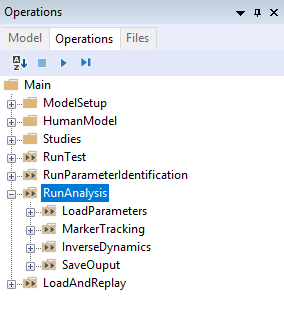 Find the Main.RunParameterIdentification in the operations dropdown, and run it. You will see the model walking repeatedly over the force platforms, sometimes slowly and sometimes a bit faster depending on the speed of your computer and the progress of the computation. The process speeds up significantly if you switch off the Model View. #### Macro command : SaveToFile(1:1)> classoperation Main"Save Values"--file="Output/Plug-in-gait.anyset"
It means that things have gone fine, the optimization has converged, and the optimized values of the variable parameters have been saved on a text file for later use. Within a brief time we can safely presume that the first is constant for a particular test subject. This means that if we have once and for all determined and saved the anthropometrical parameters of this subject, then we probably need not include them in the optimization again. We can usually presume that the marker locations on the body are constant within a given trial or series of trials performed with the same subject with the same markers attached. However, if the markers have been detached or relocated, then obviously the optimization of marker positions must be done again. However, for most cases, the computational effort of performing the optimization with all the parameters is modest, to the casual user may elect to simply redo the full optimization for each trial as we shall do later in this tutorial. Let us proceed with the kinematic analysis. 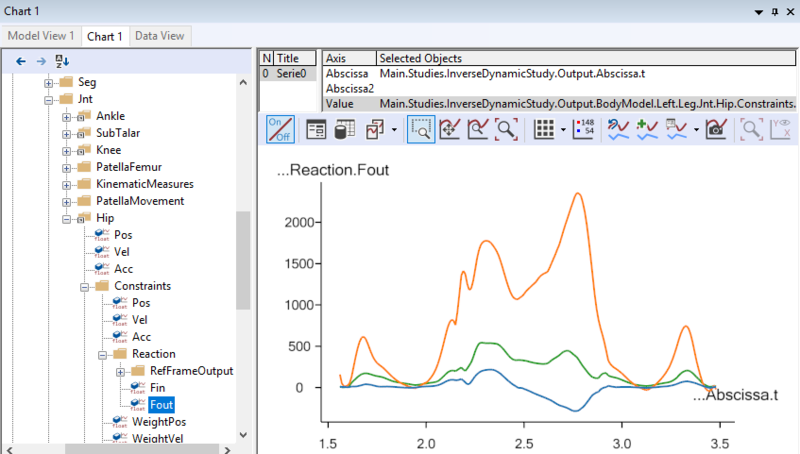 As we saw in Lesson 2: Using motion capture data marker based models usually require an over-determinate kinematic solver to handle the excess in information that the optical markers provide. The over-determinate solver in AMS works great, but it will calculate velocities and accelerations numerically. That has some performance issues when running inverse dynamics analysis. To overcome this problem, the MOCAP analysis is split into a two-step procedure, as illustrated on figure Fig. 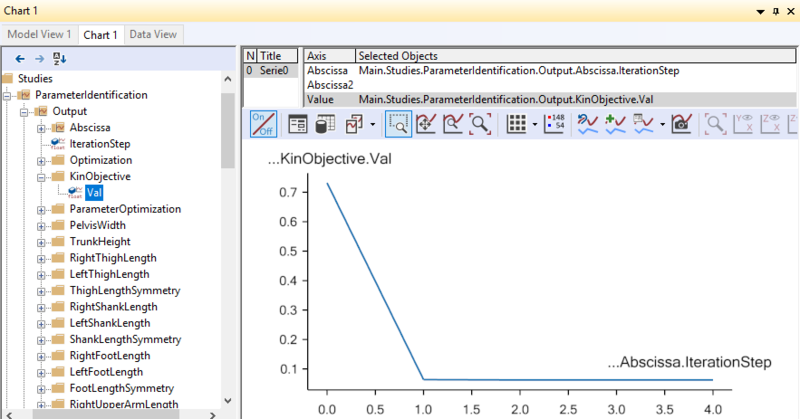 7.1, separating the Marker tracking from the Inverse dynamic analysis. 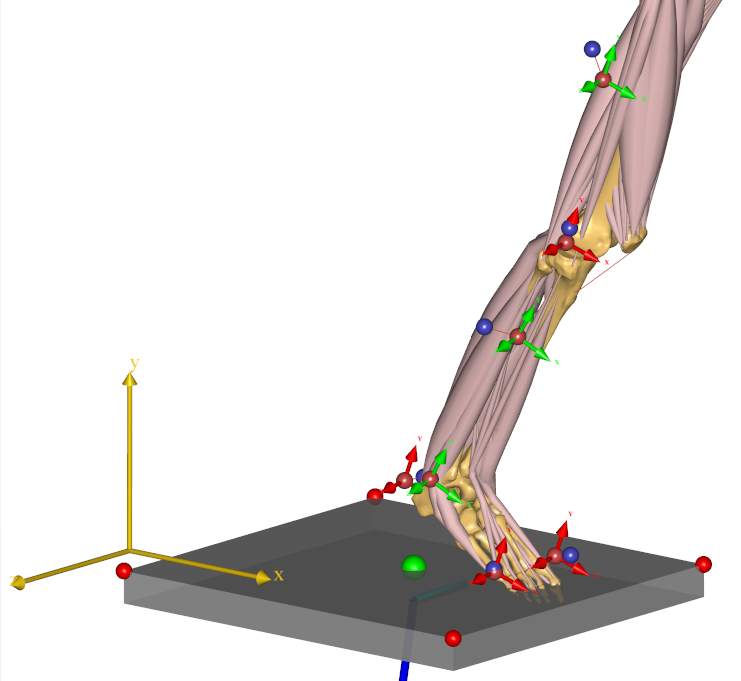 The overdeterminate kinematic analysis solves the model for positions, and stores the joint angles as function of time. This step is the “Marker tracking” step in figure Fig. 7.1. These joint angles are then used in the second step with the determinate kinematic solver in the inverse dynamic analysis. 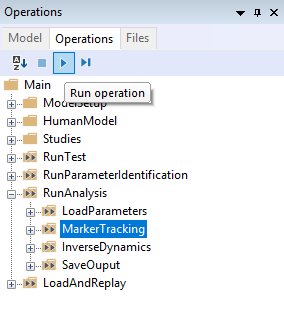 In the Model the Marker tracking and Inverse Dynamics are combined into single operation called Main.RunAnalysis. The operation contains everything that is necessary to run the analysis: It loads the optimized model parameters that were saved previously; it run the marker tracking, and if necessary performs calibration movements to adjust the tendon lengths to the lengths of the bones; and finally executes a dynamic analysis to determine forces in the system. 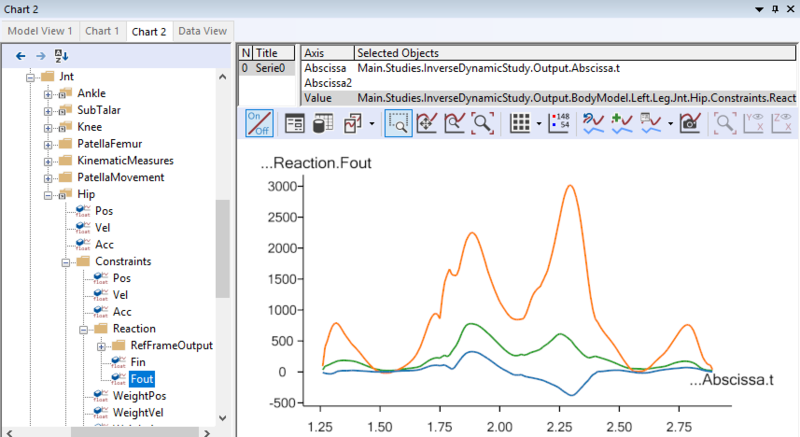 Run the analysis by selecting it from the Operations dropdown, and click “Run”. Processing a different motion is exactly the same! This file contains the settings you typically want to change when switching trials. Since this is a new C3D file from a new trial, we also need to run the kinematic optimization again. The movement seems to work fine and you will notice that this gait pattern is a little different from before. The steps are longer and the posture indicates that this is a person in a hurry. #### Macro command : SaveToFile(1:1)> classoperation Main"Save Values"--file="GUI_Plug-in-gait_fast.anyset"
Next, we run the combined Marker tracking and Inverse dynamics (Main.RunAnalysis) operation. Which, after the analysis can provide a new hip joint force profile documenting that faster gait lead to higher hip joint forces. 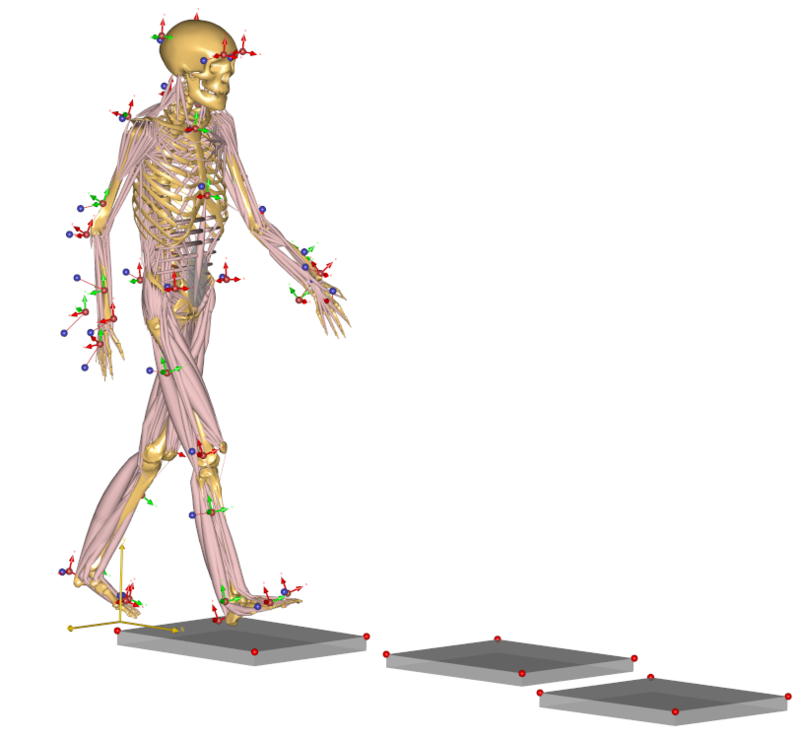 Many motion experiments deal with the entire body as opposed to just the lower extremities. 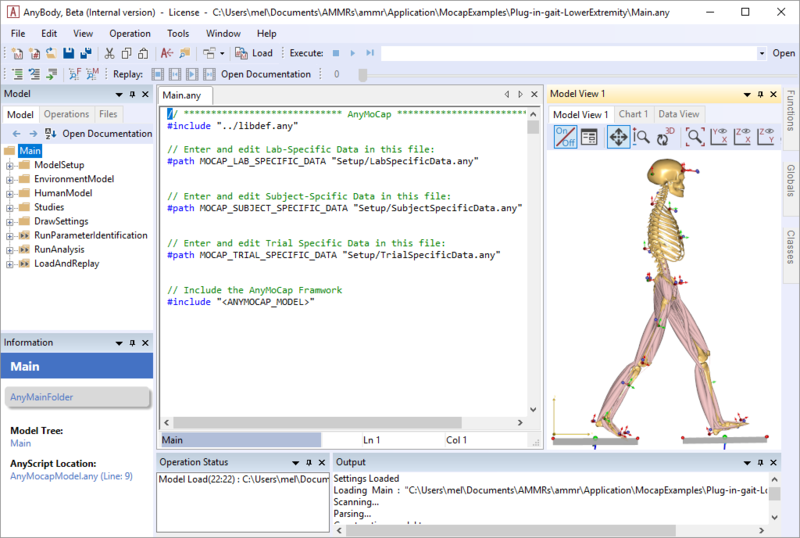 The Model Repository contains another pre-cooked model for this purpose, and it will reveal that there is more data in the C3D file we just imported than we saw in lower extremity model. Please load the model and open a Model View if you do not already have one. You will see the model as before, but now with the arms included. Eventually, the optimization process terminates and you can switch run the Marker tracking and inverse dynamics (Main.RunAnalysis) and perform the analysis of the entire body including the muscle forces. 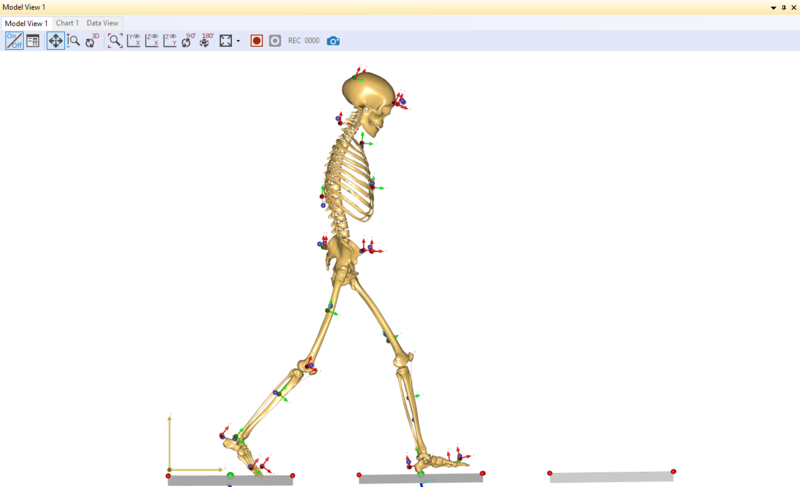 This full-body model with almost 1000 muscle fascicles takes considerable more time to analyze but will reward you with very detailed information about the function of the muscle system in gait as illustrated below. The final lesson of this tutorial is about problems that may arise with C3D files. Next lesson: Lesson 6: Troubleshooting C3D files.